Lopez Island is the third largest of the San Juan Islands and an unincorporated town in San Juan County, Washington, United States. Lopez Island is 29.81 square miles (77.2 km2) in land area. The 2000 census population was 2,177, though the population swells in the summer, as second homes, rental houses and campsites fill up. During the Wilkes Expedition, Lopez Island was given the name Chauncey Island, after the American naval commander Isaac Chauncey. When the British reorganized the official admiralty naval charts in 1847, Henry Kellett systematically removed many of Wilkes's names. He renamed the island Lopez, for Gonzalo López de Haro, the Spanish naval officer who was the first European to discover the San Juan Islands archipelago. The Lopez Island Historical Museum collects and preserves the regional history of Lopez and the San Juan Islands. The museum features artifacts reflecting Lopez's contributions to the maritime, fishing and farming industries. The museum has an extensive archive of local historical documents as well as artifacts depicting life on Lopez Island in the late 19th and early 20th centuries. This region experiences warm and dry summers, with no average monthly temperatures above 71.6 °F. According to the Köppen Climate Classification system, Lopez Island has a warm-summer Mediterranean climate, abbreviated "Csb" on climate maps. There are no highways on Lopez Island, and no bridges connecting to the mainland or other islands. The primary means of travel to and from Lopez Island is by ferry. The ferry terminal is located at the extreme north end of the island. It is the first stop of four on the Washington State Ferries’ San Juan Islands run. A typical sailing from Anacortes takes approximately 40 minutes. Lopez Island Airport is the main airstrip for the island, located on its west side, with daily commercial flights. Charter floatplanes land in Fisherman Bay at Fisherman Bay Seaplane Base, located approximately three-fourths mile north of the airport. A small airstrip called Windsock Airport also is located not far from the ferry terminal. Lopez is home to a large number of tourist related businesses, largely country-style bed and breakfasts, many with ocean views. There is a vineyard and one hotel and resort. Lopez Island is a popular destination for bicycle tourists. Some of the roads, however, are narrow which can lead to occasional traffic and bicycle congestion. But overall the drivers are bicycle friendly and the roads are easier to ride than the other islands. The island is locally famous for the longstanding custom of waving at every motorist, bicyclist, or pedestrian encountered on the island's roads. In 1996 Paul Allen bought a large Sperry Peninsula site on Lopez Island. The purchase displaced Camp Nor'wester, a summer camp for local children that had been running for 50 years. Allen also refused to return camp-owned equipment. Agate Beach County Park — This picnic area and beach is at the end of MacKaye Harbor Road at the south end of the island. Odlin County Park — This park is used for camping and picnics and has a boat launch. One of the most popular beaches on the island, Odlin Park resides just south of the Ferry Landing and is a popular stop during the summer. Otis Perkins Day Park — This park has one of the longest beaches in the San Juan Islands. Shark Reef Park — This park offers long views west over San Juan Channel. It includes a half-mile trail through some old-growth trees. Spencer Spit State Park — The focus of this park on the northeast side of the island is a long, low sandspit that almost connects to small Frost Island just offshore. This 130 acre (53 ha) park has a camping area, picnic sites and mooring buoys for boats. Upright Channel Park — This state-operated facility offers several picnic sites and a hike down to a sandy beach. KLOI-LP - local low-power FM radio station based on Lopez Island. ^ Phillips, James W. (1971). Washington State Place Names. University of Washington Press. pp. 81–82. ISBN 0-295-95158-3. ^ a b Pitcher, Don (June 2005). "Lopez Island". San Juan Islands. Moon Handbooks (2 ed.). Emeryville, CA: Avalon Travel Publishing. ISBN 1-56691-872-3. ^ Rich, Laura (2002). The Accidential Zillionaire: Demystifying Paul Allen (1st ed.). Wiley. p. 170. ISBN 0471234915. Retrieved 20 January 2018. ^ "Lopez Island Day Parks - Odlin County Park". San Juan County. Retrieved 2009-01-24. 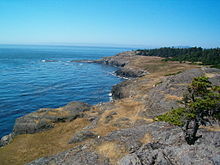 Wikimedia Commons has media related to Lopez Island, Washington. Wikivoyage has a travel guide for Lopez Island. Lopez Island Chamber of Commerce, including webcam. This page was last edited on 19 November 2018, at 19:51 (UTC).